Point-to-Point (PTP) series solutions are deployed worldwide, serving highly critical applications in formidable environments for the world’s most demanding users. 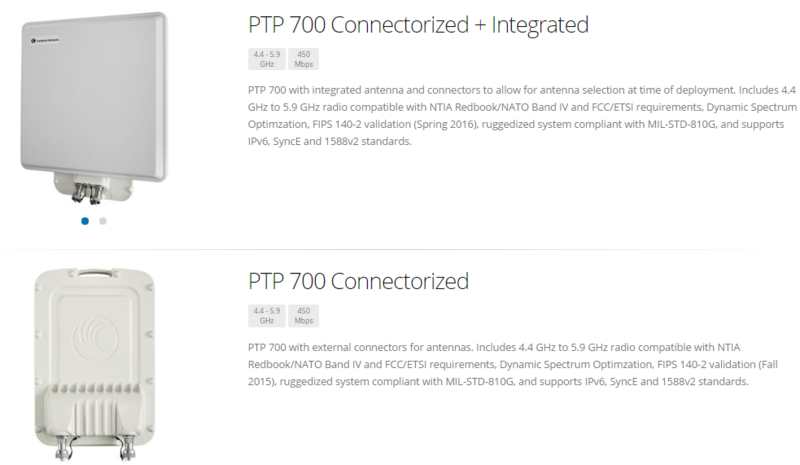 With best-in-class real-world performance and FIPS 140-2 approved security available for government and military applications, the PTP series is your connection to what matters, no matter what. Modulation Fast Preemptive Adaptive Modulation featuring 13 modulation / FEC coding levels ranging from BPSK to 256 QAM dual payload MIMO. Security 128/256-Bit AES Encryption (FIPS 197) with HTTPS/TLS and SNMPv3 management interfaces, RADIUS authentication, and configurable password rules. Configuration Point-to-point configuration extendable to high-capacity point-to-multipoint architecture. One thing in the wireless world is for sure: interference. ePMP 2000 is built from the start for the highest interference tolerance to keep your network performing at its best and your customers happy in noisy, congested real-world environments. In the real world, interference isn’t going anywhere, so it’s time our networks learnt to deal with it. 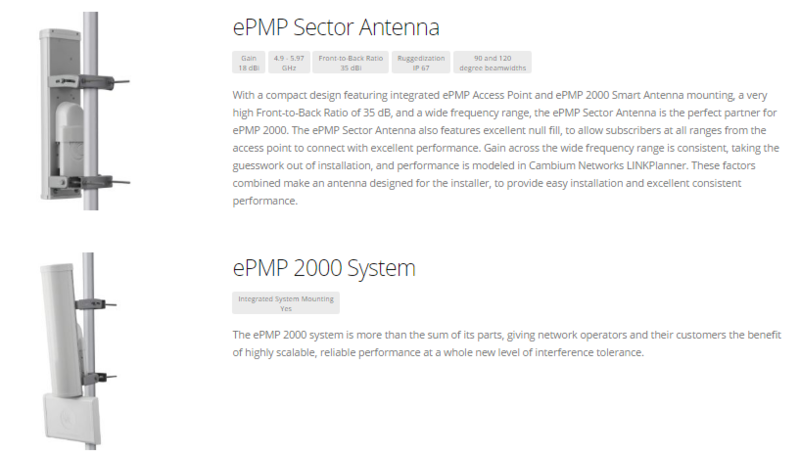 Introducing ePMP 2000 – the next generation of affordable connectivity, built from the ground up to handle interference better than ever before by Cambium Networks. 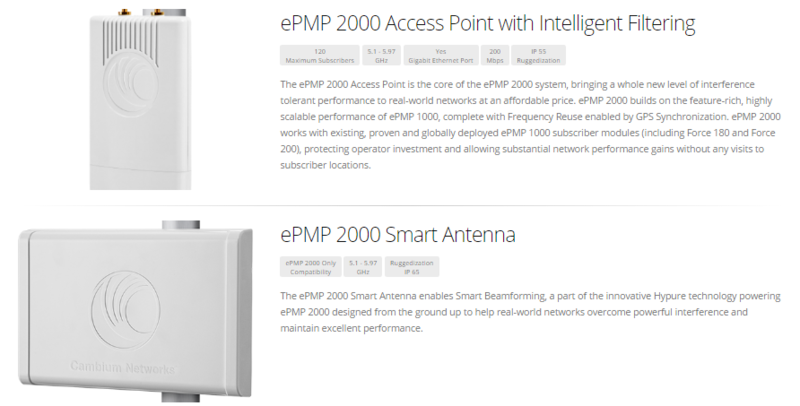 The ePMP 2000 system consists of the ePMP 2000 access point, the ePMP sector antenna, and the ePMP 2000 Smart Antenna, complimenting each other for the best performance at an affordable price. Hypure™ technology Consisting of Smart Beamforming and Intelligent Filtering, Hypure is innovative technology to keep your network operating at its best in challenging real-world conditions. Compatibility Use the ePMP 1000, Force 180 and Force 200 subscriber modules proven and deployed across the world with ePMP 2000. Frequency Reuse With frequency reuse enabled by GPS Synchronization, ePMP lets you scale your network where others can’t. Scalability Advanced, scalable scheduling mechanism supports up to 120 subscribers without degrading overall system performance. Quality of Service Multiple configurable quality of service levels let you support a diverse range of network services, with the performance your customers expect. Security With 128-bit AES wireless link encryption, L2 and L3 firewall rules, different user level support, and HTTPS/SSH support, ePMP provides enhanced security to keep your network safe. Flexible Modes of Operation A comprehensive range of operating modes let you operate your network your way. Rugged Design With rugged industrial design and industrial-grade components, ePMP is built to last from -30 to +60c. This entry was posted in Products, Wireless. Bookmark the permalink.